As I have said before I will talk about the concealer today. This was with Snow Crystal Dual Foundation. When I looked at it the first time it looked dark but goes smoothly with the foundation covering the dark circles. This isn’t a concealer to cover only dark circles; also use for covering blotches on the face. 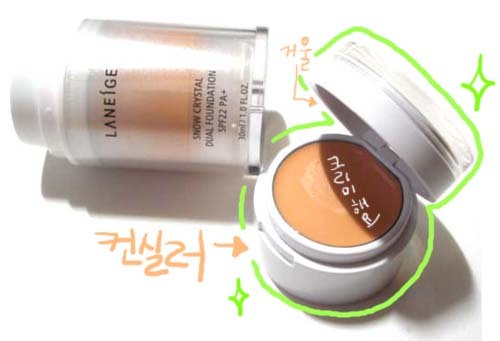 When I looked at Laneige make up look, it was used for a dark circles. The texture is creamy enough, not like other ones, too dry. This is a picture from Laneige. 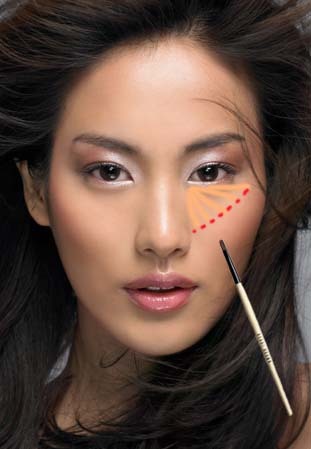 It's fine to use hand for foundation but for concealer use a brush too apply perfectly and to easily smooth out. When you are applying, follow the strokes on picture. The red dotted line is the borderline so pats it softly with your hand so it blends well with the foundation. Many people would use concealer after foundation and there isn’t much dramatic difference when you do vice versa however apply the concealer before the foundation. People, who have severe dark circles, apply the concealer lightly before the foundation and again lightly after than this way it could cover the dark circles perfectly.